Mouche is a Nuremberg-based label that tends to lean toward dub techno and techno and every else in between. Helmed by Micha Klang and heavily influenced by the likes of Basic Channel, the label has already played host to a veritable array of top-class talent since its conception in 2017, with Chris Carrier, Ivano Tetelepta, Merv and Tim Shuffle contributing to their story so far. Very much a family label, this is emphasised by the fact that each producer perks up on their latest, their first VA record and one that speaks volumes of a label clearly destined for great things. 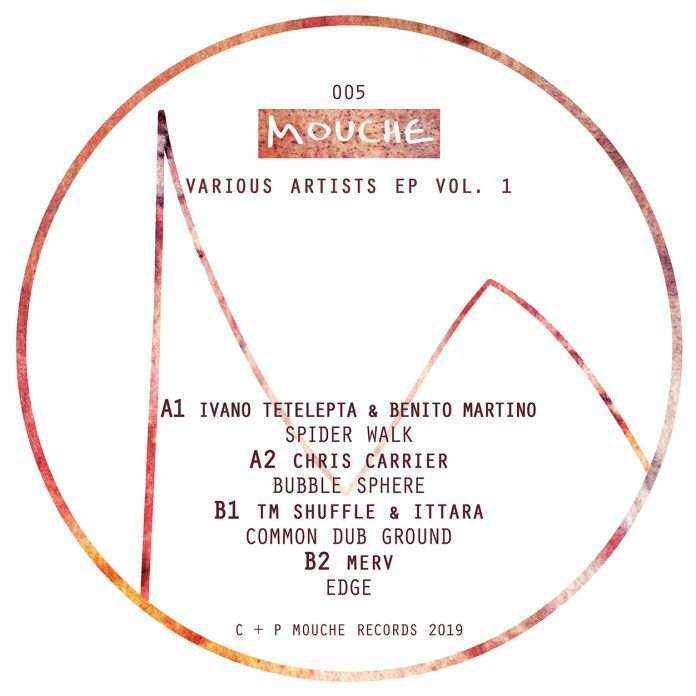 Opening up the release is the infectious strands of Ivano Tetelepta & Benito Martino (Martino being the only newcomer to the label here), courtesy of ‘Spider Walk’. A dub-heavy, minimal inclined track that’s all about the power of repetition, this one keeps a narrow focus throughout, all the way keeping us locked thanks to its weighty, downtrodden vibes. Up next is Chris Carrier, who opts for a different narrative on ‘Bubble Sphere’, The prolific Frenchman has long been known for his ability to switch up styles, and his contribution here is definitely one that showcases his techno aesthetic. Bleak but captivating, it’s a dexterous weapon that’s been designed to keep dancefloors ticking over at a brisk pace. The B side gets underway courtesy of TM Shuffle + Ittara, whose track here is undoubtedly one of the releases’s most pivotal moments. Another track that’s never lacking in atmosphere, this one glides along quite brilliantly, slowly picking up pace before a suspense-filled conclusion that leaves the listener yearning for more. A really enthralling gem, it sets us up nicely for the EP’s swansong, Merv’s ‘Edge’. The Danish production duo (consisting of Brian Oldenborg and Jan Christiansen) don’t give much away online, preferring instead to let the music do the talking. His contribution here, ‘Edge’, is an unrelenting, uncompromising cut of the sort that neatly encapsulates what the label is all about. Solid, for-the-floor dub techno of the type that doesn’t mess about, it culminates a killer EP with some grace.